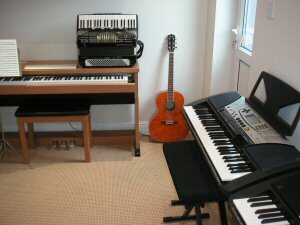 Langenhoe Music School is a privately run, well established successful school, offering in house tuition at our fully equipped studio, and home visits for Piano, Keyboard, Organ, Accordion and Theory of Music lessons with Victoria Andrews. We also offer a teacher search service, for all other instruments, providing professional, committed musicians who are currently taking on students. So no matter what instrument you require, we can find the right teacher for you, in your area. We teach a wide variety of ages and abilities, and styles of music, and have experience in teaching students with special needs. So whether you wish to follow a progressive exam structure, or learn purely for fun, music lessons at Langenhoe Music School are for anyone, and it's never too late to learn! We are located 4 miles from Colchester town centre, heading towards Mersea Island. If you would like to place an enquiry for music tuition, please click HERE for details. If you are a teacher and you would like to register with us, please click HERE for details.